So who are the Americans that Mitt Romney says are "dependent on government?" A lot of them are his biggest fans: seniors. Older Americans -- those who get help from Social Security, Medicare and Medicaid -- are a big part of the nearly half of households receiving some kind of federal benefits, according to the most recent Census Bureau data. "Seniors are the biggest beneficiaries of the government," said Veronique de Rugy, senior research fellow at the Mercatus Center, a free-market think tank at George Mason University in Virginia. "These are also the ones who overwhelmingly vote for Romney." According to a video of Romney's remarks at a May fundraiser that was published Monday evening, the Republican presidential candidate told supporters that he couldn't concentrate on voters who are "dependent on government, who believe that, that they are victims, who believe that government has the responsibility to care for them. Who believe that they are entitled to health care, to food, to housing." Romney said those voters were certain to pick President Obama. "I'll never convince them they should take personal responsibility and care for their lives," he added. The most recent Census data -- from the second quarter of 2011 -- show that 16% of households have someone receiving Social Security, and 15%, very often the same households, have someone benefiting from Medicare. 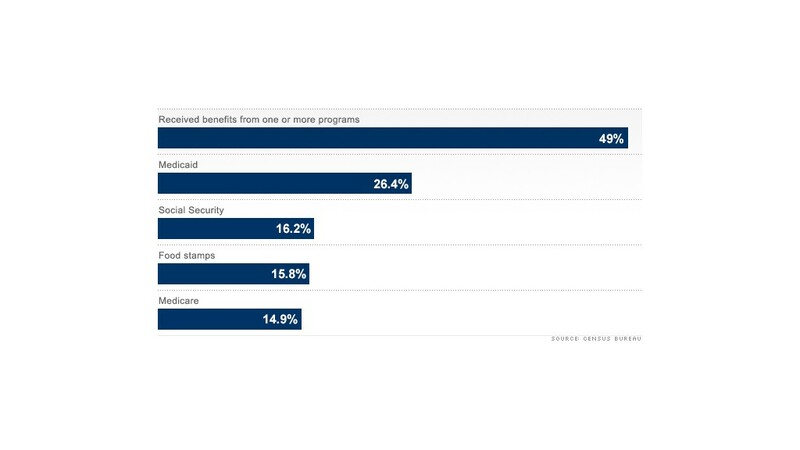 The only program that is more widespread than Social Security is Medicaid, which helps 26% of households. But there aren't a lot of votes for either candidate among Medicaid recipients -- half are children and a small portion are seniors. Meanwhile, programs that aid poor people of working age make up small chunks of the federal aid mix. Recipients of food stamps represent 16%, according to the Census figures. Accounting for less than 10% each are households that get help under Women, Infants and Children, which provides nutrition assistance, as well as housing assistance programs and the Temporary Assistance for Needy Families program, which is commonly referred to as welfare. Despite the fact that unemployment that was about 9% during the quarter the reading was taken, less than 2% of households had someone receiving unemployment benefits. Many unemployed job seekers don't get help because their jobless benefits have run out or they didn't have a job that qualified them for help in the first place. In the fundraiser video, Romney also spoke of 47% who pay no federal taxes. But even some Social Security recipients pay income tax because their income is large enough. And recipients of other benefit programs who work and collect a paycheck get money deducted for the payroll tax that funds Social Security and Medicare -- even if they don't earn enough to pay federal income tax. "I think this is a tremendous unfairness in the system where the relatively young and poor people must transfer wealth to the old who might be wealthy," said the Mercatus Center's de Rugy.